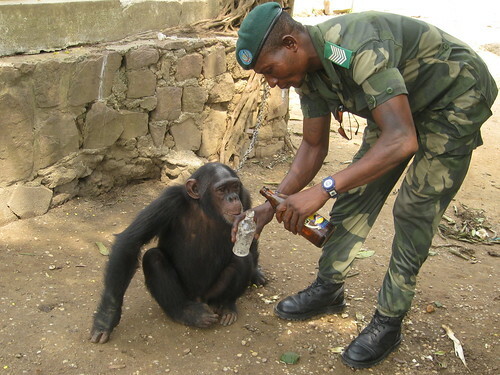 Meet Jacques, the chimp in front of the Army General’s house in Kisangani, capital of Orientale Province. Kisangani does keep prisioners…the right ones? The end of 2010 was grim for wildlife throughout DRCongo (as Jacques from Kisangani –pictured above — reminds us), but for elephants it was bloody ashen. What forest did not echo with reports of AK47s and FALs? One province was particularly bloody: Orientale Province, northeastern Congo,home to more protected areas than any other province. Orientale has Garamba National Park and part of Maiko National Park. Here are the Okapi Reserve, Bili Uere Reserves, Rubi Tele Reserve and the northern part of the TL2 landscape. It is within these “protected areas” that band after band of poachers with military weapons and military munitions track the remaining elephants. Okapi Reserve, 23rd of December: Two park guards are shot dead by poachers. The message comes by email from the Okapi Reserve headquarters. Is it true that the first guard had put down his arm and was questioning a poacher when a second poacher shot him dead? These poachers were later seen heading with their ivories towards Kisangani more than 450 km further west. TL2, also 23rd of December : two poachers arrested by local authorities, the Chef de Post Lowa with the local captain of police. The poachers have elephant meat and a military weapon. When they were apprehended the ivories had already been dispatched to Kisangani more than 200 km to the north. A local TL2 field assistant brought me this information. 14 January : a Thuraya message from our team at Obenge. An elephant has been killed near Lokobekobe. Bili Uere, Mid- december: our field team, heading north to assess the elephants, report a member of the general’s body guard coming south towards Kisangani with ivory. 16 January : our team has reached the town of Bili and can find no one to guide them across the Gangu river. The villagers are frightened. Men with military arms and abundant munitions are in the forest hunting elephants on the other side of the river. Question : In Congo what illegal behavior would cause military personnel to be revoked? Or perhaps as long as only their superiors know about it, it is ok? Question : Once they arrive in Kisangani with their booty do all of these military slip back into active duty? Is poaching their active duty? 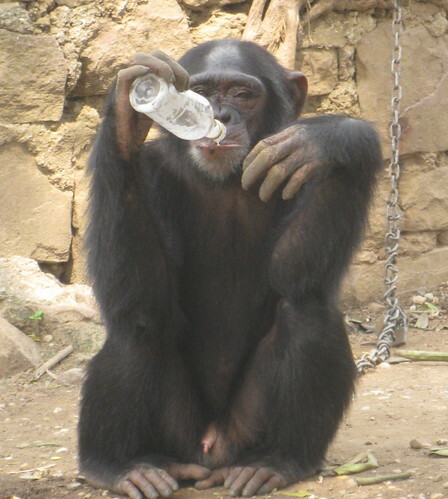 The position of chimp and soldier are not so different: both front-gate guards at the house of the general; they share a swig of beer, a tok of pot. No, the difference is vast: the former is of a fast- disappearing species and the latter is of a fast-growing species, plugging the emptiness left by the former. Forests without apes and elephants, ….perhaps it won’t matter if there are enough people? COLLEEN!! Thank you for pointing out our error. smiles. This entry was written by Terese Hart, posted on 2011-01-18 at 1:45 pm, filed under Bonobo, Elephant. Bookmark the permalink. Follow any comments here with the RSS feed for this post. Post a comment or leave a trackback: Trackback URL. I cannot understand the obsession with humans to make alcoholics and drug addicts of our animal cousins. It is an horrendous practice and I can’t see what they gain from doing it. Will it ever stop!? Thanks so much for posting this update. Very disturbing news from Bili, and in particular the Gangu Forest. As you know, when we did transects through it in 2005 we found no signs of human presence and abundant signs of elephants. I imagine the situation may be completely reversed now. I look forward to reading the full report from the field team. We definitely will post the Bili updates. Frustrating!! Maurice and Christian just got to Kisangani today and I will get up there on Tuesday (now in Kin) for a first debriefing. So sad to hear about the 2 parks guards being killed at the Okapi Reserve. These vicious assaults on the parks, the guards, villagers, and the wildlife have to end. Such a difficult situation. Best wishes for everyone protecting the flora and fauna of the Congo. 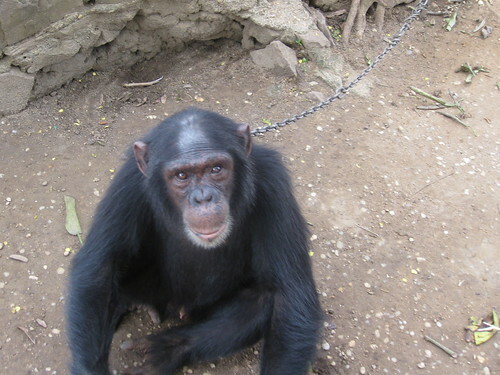 I would like to know the status of chimpanzee Jacques is pictured in your article. Is he still alive? Where is he? In Kisangani? The provincial authorities certainly know his existence but the sanctuaries in the DRC are they informed them of his existence? It may be possible to do something for him, right? Could you contact me please! it’s very important!